January 22nd, 2010 by KTU | Filed under 2. Site preparation. 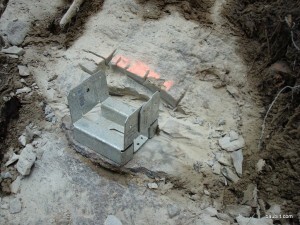 Flat spots cut in boulder with angle grinder for columns. 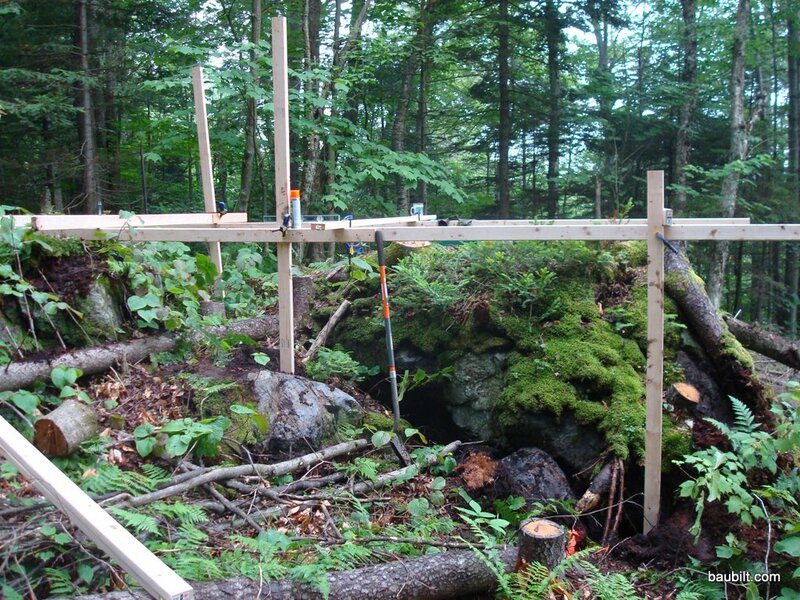 The structure is basically two 3 1/2″ x 10″ x 16′ beams supported in three places along their length and then tied together with some cross members. There are some diagonal cross braces to keep everything rigid. The beams were cut at the local saw mill and hauled (dragged really) down the trail a few feet at a time. The beams were wet, wet, wet…cut from green hemlock. But, wood does not shrink much axially when it dries (in contrast to shrinkage across the grain, which is significant) so I didn’t worry about building with the green lumber. The only real problem with green lumber is that it is very heavy, maybe 300 lbs. for each of these beams. 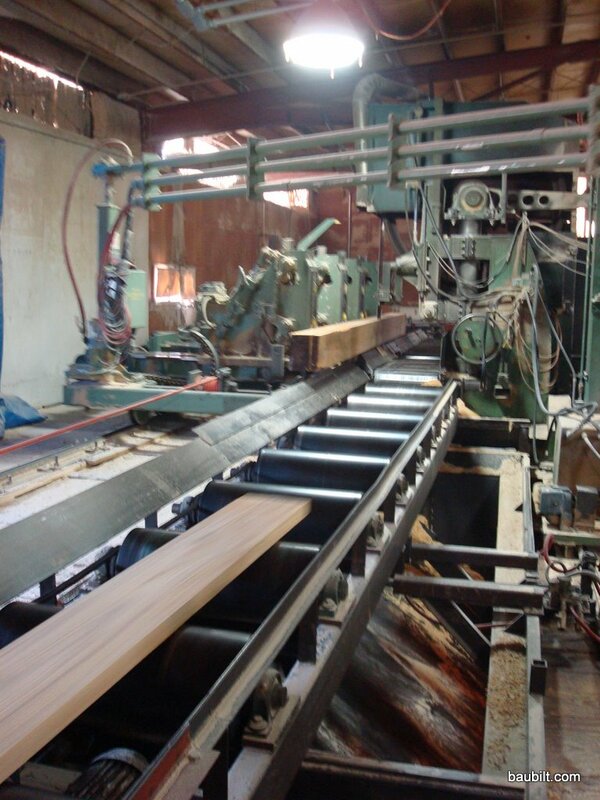 Main beams being cut on band saw at local mill. 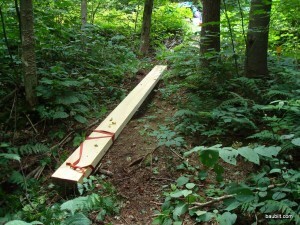 Hauling beams down trail a few feet at a time. One of the those six support points was a soft patch of organic soil. I did not want to dig a deep hole for a concrete pier, so I just dug out a decent sized hole and filled it with gravel collected from the stream. 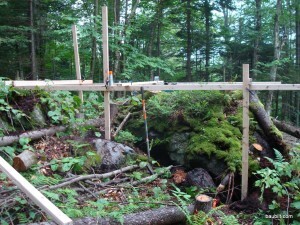 I set a concrete lintel on the gravel and set the post on the lintel. It hasn’t moved in over two years, so I think I’m going to be ok. Here is the basic support structure in place. You can see the concrete lintel at the nearest support point. In retrospect, I would have used 6×6 posts instead of 4×4 posts to support the structure. A 4×4 can support over 20,000 lbs. in compression and my entire building with snow and contents only weighs about 20,000 lbs., so they won’t fail. 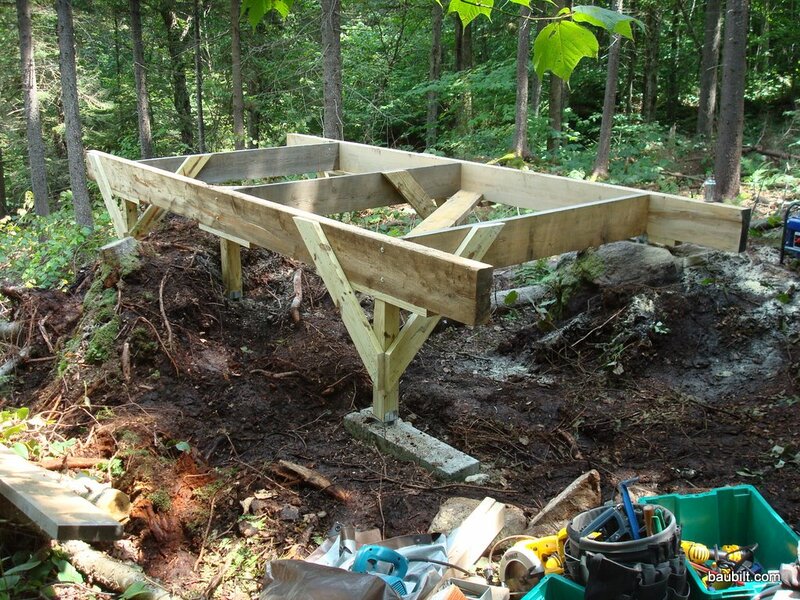 Still, they seem a little spindly now that the structure is completed. 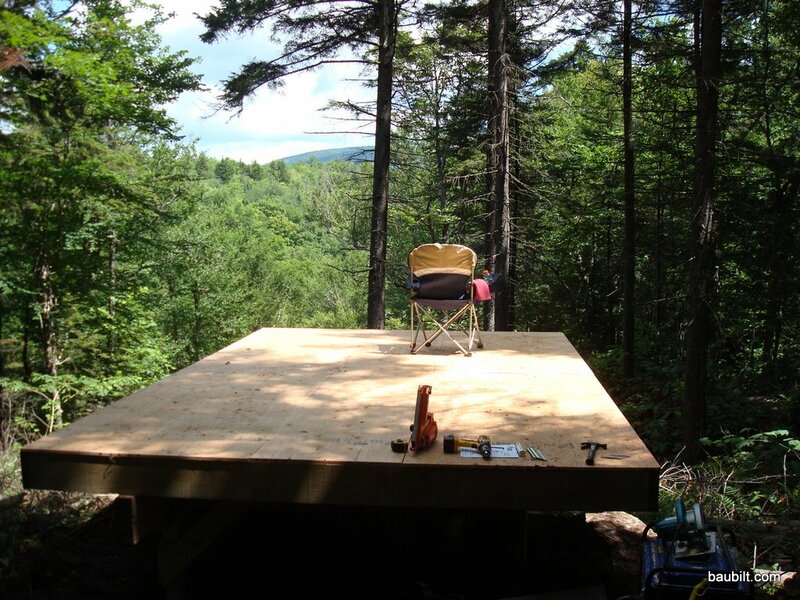 Finally, I placed five sheets of 3/4″ plywood on the deck and nailed every few inches to form a (hopefully) very rigid deck on which the rest of the structure would be placed. I had planned for the deck to be exactly 16′ long, and it was, so the plywood went in place quite nicely: 2 sheets end to end laid out in two rows, with one sheet cut into two 2′x8′ strips and laid down the middle. This is only place where my careful planning back at my desk actually worked out perfectly. It has worked out very well. As far as I can tell nothing has moved, even a millimeter.